It was April 26, 2007 when Etihad flight 451 left Sydney bound for Abu Dhabi. Up in the pointy end of the plane were the top brass from Jupiter Mines. They were in rollicking form and, in the hallowed traditions of Aussie long-haul drinking, gave those complimentary refreshments a first-class nudge. Such was the magnitude of this nudge – which kicked off with a spot of champagne, cognac and port before the lads were refused service and impelled to resort to their duty free stash – that David Evans and Jeremy Snaith were soon enshrined in Melbourne Mining Club folklore as the Bananas in Pyjamas. The alleged incidents included lewd acts while the Jupiter directors were robed in Etihad’s Diamond Class nightwear. Yet it was no laughing matter for B1 and B2. They were soon arrested in Abu Dhabi. Evans was convicted of sexual assault, though released on bail. Snaith and one other were not so lucky; packed off, as they were, to the al-Wathba prison in the desert and forced to endure 50-degree heat and a diet of fermented camel milk. But there was a happy ending for Evans and Snaith. The lads soon turned up in Cambodia as joint managing directors of gold and copper explorer Battle Mountain Minerals, which later became Indochine and floated on the Australian Securities Exchange. Somehow, they managed to jag an exploration licence for ground up near the borders of Laos and Vietnam. The area is known as the Dragon’s Tail and is extremely prospective ground for mineral exploration. The catch is that their licence also happens to encompass 54 per cent of the heritage-listed Virarchey National Park. Apart from its exotic flora, this is the home of the Cambodian tiger, Asian elephant, gibbon and the sun bear, not to mention the clouded leopard. So rich in biodiversity is the Dragon’s Tail that the World Bank has been pushing to have it protected from mining, even providing $US4.7 million in loans and grants to an environment ministry program. 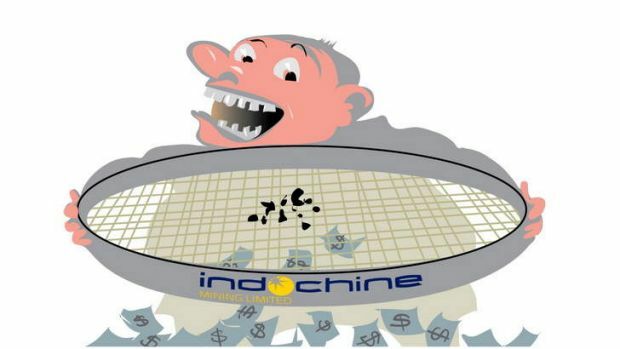 Indochine floated on the ASX in December 2010. All up, it has raised some $115 million in equity, thanks to the efforts of colourful Sydney stockbroker Gerard Farley. In turn, Farley’s Empire Securities has reaped $15 million in fees. Gerard Farley was not available for this story. He is on a yacht in the Mediterranean and difficult to contact, said his brother Gavan, who is on the Indochine board. Gerard’s claim to fame is the Thai-based miner Kingsgate Consolidated which Gerard steered from around 10¢ a share all the way to $10. It’s back at 89¢ now. Indochine has not fared so well. It floated at 20¢ and traded doggedly down to 3¢. Now it faces a breach of contract claim from its former chairman and chief financial officer Rob Coghill, who was incidentally also on board Etihad 451. The rub is that Coghill’s claim is for $4.7 million – more cash than Indochine appears to have left. Yet there has been no disclosure of the lawsuit to the ASX, despite the fact that it could take Indochine to the wall. Typically, cash doesn’t last too long at Indochine. Although it is but a junior explorer with no income, directors and executives are helping themselves to $2.2 million in pay. Chief executive Stephen Promnitz is on a package of $623,000, Cambodia chief and former criminal lawyer Ross Hill picks up $370,000, a bloke in PNG gets $586,000 and non-executive directors even get super. The claim may present deeper challenges, though. The background involves what appear to be allegations of some fairly racy transactions, transactions that have been confirmed to Fairfax Media by other former Indochine executives. Apart from the facilitation payments to companies associated with wives of Cambodian politicians for services such as arranging meetings (invoices sighted by Fairfax Media), there was the matter of a curious dispute over a payment to a major shareholder, Cambodian company BKVS Enterprises, which is associated with Lone Wolf bikie Brian Blackman. Blackman was jailed for smuggling cocaine after a sting on a corrupt customs ring at Sydney Airport in 2012. Of course, there is nothing wrong with bikies owning shares. The oddity is that a company linked to this bikie received a cheque for $175,000 from a minerals explorer in Cambodia (dated August 28, 2009, and signed by former managing director David Evans and Ross Hill, chief operating officer and Blackman’s brother-in-law). ”What was the purpose of the payment?” we asked Stephen Promnitz. Promnitz is a late addition to the Indochine show. He is there to lend management muscle to the group’s efforts to develop the controversial Mt Kare deposit in Papua New Guinea.